This is the story of a young teacher named Saleha Parveen who fought against societal norms to give the children in her neighbourhood a good education. 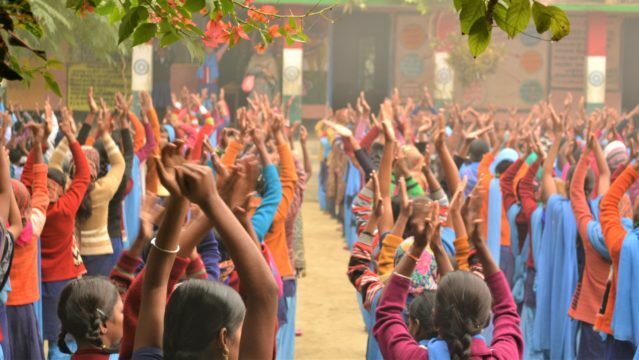 The Anandshala approach has evolved from the School Dropout Prevention Pilot Program (SDPP), a USAID-funded, 4-country program implemented from 2011-15. The successful outcomes of the SDPP included a marked rise in attendance rates and better identification of at-risk students, an improvement in children’s Language and Math scores, vastly improved student-teacher relationships, overall better learning environments in schools, and an evolved role of parents, teachers, headmasters and education functionaries in children’s education. One of the schools where the SDPP was implemented was Vishnupur Bande School in Samastipur district, Bihar. Saleha Parveen teaches there. She uses the training, knowledge and skills acquired from the program to speak freely with her students so they can see she’s there for them. She has made her classroom more engaging and fun, incorporating songs, games and activities that keep children interested, motivated and confident. She works hard to keep children in school. Saleha Parveen’s commitment to her students does not stop after school hours. In sessions with parents, she tells them that they can play a powerful role in supporting their children’s education, in many cases, despite their own illiteracy and lack of education. You can read more about Saleha Parveen’s inspirational journey here!